In this lost season, most Mets games — especially the losses — have followed a similar pattern, almost resembling that of a Choose Your Own Adventure. If the Mets are able to piece together some hits and score some runs, they might get a few solid innings from their starting pitcher before the bullpen inevitably enters the fold to blow the lead into pieces. There are usually two paths if the Mets aren’t able to score early, the first featuring a half-decent start and strong relief pitching with the second consisting of a brutal beatdown by the opposition in all aspects of the game. Monday’s Subway Series opener at Yankee Stadium followed the first pathway, as Curtis Granderson and Yoenis Cespedes hit solo home runs off former Met Luis Cessa to give the Mets a 2-0 lead in the 3rd inning. Cessa, who went to the Tigers with Michael Fulmer in the deal that brought Cespedes to Flushing in 2015, pitched well and threw hard in his 4.1 innings before leaving with what appeared to be an arm injury. Somewhat stunningly so, Rafael Montero also pitched well, only allowing two runs in six impressive innings. Spotted the early lead, Montero was on the verge of total collapse in the fourth when he loaded the bases with one out, but he coaxed a sacrifice fly from Gary Sanchez and got Chase Headley to fly out to escape more damage. He wasn’t out of the woods, though, as Aaron Judge greeted him with his 36th homer of the season in the sixth to the tie the game at 2. Montero was able to get the next three batters out to finish off one of his best starts as a Met. The key for him has always been to keep his cool when in bad situations, and not being able to do just that has resulted in his rough season. Monday was a solid step forward, even though he coughed up the lead. After Hansel Robles managed to barely eke through his usual high-wire act of a seventh inning, he was left in to start the eighth by Terry Collins, which predictably blew up right in TC’s face, to the surprise of no one. He grooved a pitch to Aaron Hicks, who promptly deposited it in the right field seats to give the Yankees a 3-2 lead. Did Hansel point skyward as Hicks’ homer soared far over the fence? Why yes, yes he did. Two batters later, Erik Goeddel gave up a bomb to Sanchez to officially put a cap on this one. Dominic Smith reached base with an infield single in the 9th against Dellin Betances to bring up Amed Rosario as the tying run. He struck out on three pitches. Will the offense reveal itself? Not really a banner night for the Mets’ hitters. The Granderson and Cespedes home runs were the road team’s only extra base hits of the night, as the rest of the lineup scattered four hits and three walks. Granted, the lineup without Neil Walker, Jay Bruce and Lucas Duda is a little lacking but the Mets who were in the lineup on Monday didn’t put up much of a fight. The main issue was that guys just kept swinging right through the hard fastballs of Cessa, Chad Green and Betances and over the curveballs of David Robertson. Rosario continues to struggle with the strike zone and with Smith still getting acclimated to big-league pitching, the Mets just don’t have a very deep lineup right now. The rare good news is that Green through 45 pitches and might not be available for the next few days. After his loss against the Rangers last week, Terry Collins had this to say about Montero: “We don’t have a lot of options right now. And if we can’t come up with an option, he’s going to go back out.” Not exactly a ringing endorsement. Montero at least earned another start with his performance in the Bronx, but that’s probably more due to the current state of the Mets’ pitching staff than Montero himself. Still, though, his talent is undeniable. The 95+ mph fastball and sharp slider (at times) definitely plays in the majors, especially because his heater — when on — seems to have deceptive movement on it that puzzles hitters. His issue is keeping positive momentum going, which means how he pitches this weekend against the Marlins will tell us if Monday was a fluke or legitimate progress. Through 13 games (for Rosario) and four games (for Smith), the Mets’ rookies haven’t exactly been lighting the world on fire. Amed’s problem is obviously his preponderance of strikeouts and, conversely, his lack of walks. In 44 plate appearances, the Mets’ top prospect has struck out 12 times and walked none. Obviously, that won’t keep up and it’s silly to make any legitimate determinations based off such a small sample size. It’s simply worth nothing. For Smith, with even less plate appearances — just 14 — what’s apparent is that he has a very good command of the strike zone. Whether it’s laying off balls or just fouling back tough pitches, he has an approach that goes well beyond his 22 years. He basically hasn’t hit anything hard in the air yet and most of his contact has been up the middle and on the ground. Like Rosario was in his first two series in Denver and at home against the Dodgers, Smith is still getting his feet under him. Put the pitchforks down. 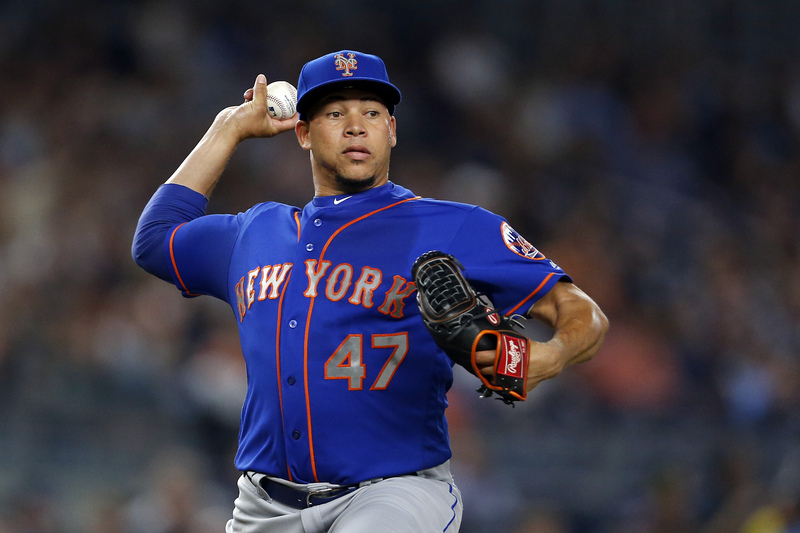 Tuesday brings one of the better pitching matchups the Mets have been a part of this season, as Jacob deGrom returns to the site of his MLB debut to face off against new Yankee Sonny Gray. Could be a lot of strikeouts on both sides.